It had been one of those days. Aaron had been unfocused and unproductive all morning. Thinking that a short break might help, he headed to the break room and poured himself a tall cup of coffee. After stirring in three tablespoons of French vanilla non-dairy creamer, he took a sip. He smiled. He never could handle the stuff black, but with the creamer it was just right. Grabbing a couple packs of sugar, just in case, he headed back to his cubicle to see if he could finally get some work done. Many people enjoy the taste of non-dairy creamers in their coffee just like Aaron. Some enjoy the plain versions, while others like to indulge in the flavored varieties, such as Irish cream, hazelnut, French vanilla, amaretto or toffee nut. The problem is that even though non-dairy creamers might make our drink look and taste better, they might not be that healthy. Why are non-dairy coffee creamers unhealthy? Portion size: The serving size listed on non-dairy creamers is 1 teaspoon and that serving only has 10 calories. 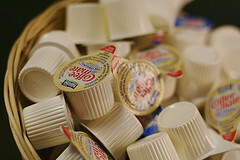 So, initially you might think that creamers are not contributing too many extra calories. But how many teaspoons of creamer do you use in your coffee? Not many people use only one teaspoon. On average people use 1-2 tablespoons (3-6 teaspoons! ), which turns the 10 calories/serving into 30-60 calories for a cup of coffee. If you have multiple cups a day, the calories can really add up. So, the next time you use creamer, measure how much you put in. Partially hydrogenated oils (trans fats): If a food has less then 0.5 grams of fat per serving, food companies are allowed to round that number down to zero. But if the serving size is small like in creamers and you use a lot of servings, that number can start to matter. Even 0.1 grams of trans fats multiplied by six, three times a day becomes 1.8 grams/day. If the amount was 0.4 grams that would become 7.2 grams/day. This is where reading the label comes in handy. If the ingredient list has partially hydrogenated oils listed, then you have trans fats in the creamer. Trans fats are harmful to your health and should be avoided if possible. They have been linked to an increased risk of heart disease and possibly other health problems. In fact, unlike saturated fats which only raise the bad cholesterol, trans fats lower your good cholesterol as well. That’s a bad thing because the good cholesterol helps to combat the bad cholesterol. What else can I use in my coffee? If you need something to flavor your coffee, here are some healthier alternatives that might work for you. Milk: Try adding nonfat, 1% or 2% milk to your coffee. These products have no trans fats and less calories than the popular non-dairy creamers on the market. Fat-free Half and Half: This alternative only has 20 calories per 2 tablespoons and has no trans fats. It does have some trivial amounts of fat though, so be aware of that. They just occur in amounts less than 0.5 grams per serving allowing them to round down to zero. Non-Milk Alternatives: If you are lactose intolerant or prefer to avoid milk, try soy, rice or almond milk. They are all free from trans fat and tend to be lower in calories. Personally, almond milk is what I prefer to use when I drink coffee. It is a healthy choice and gives the coffee a nice flavor. Don’t let the non-dairy creamer companies fool you with their misleading labels. It is important to read the labels and really know what you are consuming. You don’t want to sabotage your healthy diet with hidden calories and fats. Now you can see past their little tricks and enjoy your cup of coffee without all those extra calories and fat! All they have here at work is those fake creamers and they are so gross. You do need to empty a billion into your drink just to make a difference. And im suspicious of something that doesn’t need to be refrigerated. I buy a container of soy milk and keep it at work for cereal, tea, iced coffee. Its much healthier and, more importantly, yummier. I just kicked the non-diary creamer habit and it was hard. I now use milk or half & half. I was shocked to find out how much saturated fat is contained in these products. It doesn’t matter if you’re using liquid or powder. Thanks for sharing w/ everyone and trying to make the world a little healthier. Thanks so much for the info. I’ve been trying to eat healthier, grow my own garden, eat organic, cut out the BPA lined foods and reading/studying a lot about obesogens (hormone disruptors) in our food system and the partially hydrogenated oils were listed as one, so I thank you so much for these helpful suggestions. I am going to try flavored, organic fair-trade coffee (hazelnut flavored if I can find it) and sweeten it with almond milk and xylitol-a sweetener I bought at my healthfood store that tastes better than stevia. Like I said, trying to do the right thing within my wallet’s limits. Best of health to you all! I have switched to zilitol which is ok but the creamer is a problem. I tried milk and 2% evaporated milk. Yuck. Hopefully the almond milk will do the trick. Frankly, trying to eat healthy is not easy. My biggest downfall is blue cheese dressing. I would rather not eat salad than give it up. Any suggestions? I’ve been a user of non-dairy cremer powder for at least 30 years. I am very nervous to know what may have happened to my insides as a result of this.. If there are any Dr.’s reading this.. please respond back to me…. How many grams of creamer is there per tea spoon? It cant be more than 2 grams or? How come people use creamer when milk powder taste much better? My friend just told me that International coffee creammer has no trans fat!! Great article!! I was thinking about this the other day and thought I can’t be alone in knowing this stuff is not a good choice. I personally like Organic Valley’s soy creamer when I don’t want my coffee black – which isn’t very often. Where do you buy the O V soy creamer? I have to be on a low fat diet for high col. And I just cant give up my flavored creamer in my coffee. I love Irish cream. I do use Silk brand soy milk. I guess they make a coffee creamer now too. I will have to try that also. And Id like to try the Almond milk. I wonder how that would be in coffee? These days I use the organic almond milk that Trader Joe’s sells. I like that one a lot. They have an original and a vanilla version. I use the original, but the vanilla one might be more to your liking if you’re into flavored creamers. The soy and almondmilks have carageenan. Bad stuff. Great info. I always wondered about the non dairy creamers! This will be my new years thing to give up! Thank you! Thanks so much for the info.I’ve been a user of non-dairy cremer powder for at least 20 years. I see a few comments related to an alternative – SOY, end just as bad. google soy dangers and you’ll see exactly what im refering too. you get good soy and bad soy/ fermented soy and unfermented soy….wanna know which soy you are consuming???? try the cheaper bad soy. I found SoDelicious Coconut Creamer and loved the taste until I read that Titanium Dioxide is in the ingredients ! Any suggestions on how harmful this could be in this product? all this talk of transfat… what about calories? I do touch on the calories in the section on portion size. I tried Maxwell House International foods coffees that do have some of the dried fake creamer. Both real cream and these products have fat — one has trans fats, the other saturated fat. I drink/drank way too much natural cream. Isn’t 2 tablespoons of the fake coffee better? (2 cups per day)? I have a high cholesterol and need to change my diet, I need to find a coffeecreamer which is healthy , been using Silk coconut, vanilla flavor creamer from a healthstore . Do I need to be concerned?? ?